Offered in SUPERB CONDITION THROUGHOUT. 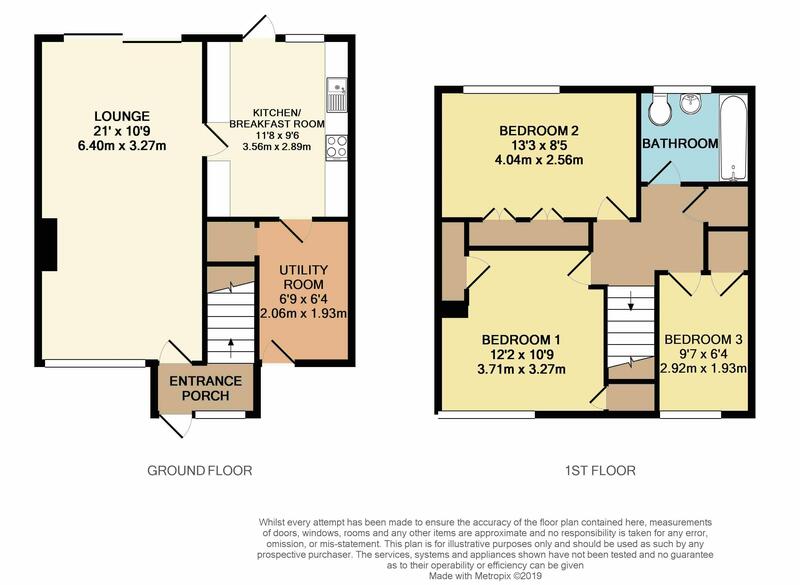 This THREE BEDROOM home comprises. Entrance hall, SPACIOUS 21 FOOT LOUNGE DINER. REFITTED KITCHEN.UTILITY ROOM. Luxury bathroom. Enclosed gardens. Gas central heating and UPVC double glazing. Within easy walking distance of local schools and shops. Double glazed front door with double glazed window to the front, stairs to the first floor, dado rail, part glazed door to the lounge. With a double glazed window to the front and double glazed sliding patio doors to the rear garden, dado rail, radiator, TV point, wood burner, coving to the ceiling. A refitted kitchen boasting a wide range of base and eye level storage units, display cabinets, breakfast bar, work surface areas with inset single drainer sink unit with mixer tap, built in double oven with hob and extractor fan, plumbing for washing machine, tiled surrounds and flooring, UPVC double glazed door and double glazed window to the rear garden, coving to the ceiling. With space for appliances, gas meter, under stair storage area, UPVC door to the front. Stairs to the first floor, radiator, dado rail, thermostat, access to part boarded loft space, coving to the ceiling. Double glazed window to the rear, built in wardrobe and dressing unit, radiator. Double glazed window to the front, built in wardrobe, radiator. Screened by mature hedging, laid mainly to lawn with surrounding borders, pathway to the front doors. A fully enclosed rear garden, with paved patio area to the immediate rear, laid mainly to lawn with established surrounding borders, further raised decked seating area, outside tap and lighting, gated rear access.